On the 28th of March, the MD Dept of the Environment (MDE) held a public hearing in Charles County, MD concerning Dominion's proposed fracked gas compressor station. Near the beginning, someone projected scenes of what a potential explosion at the compressor station on the walls of the room. MDE tried to order the projector turned off while the packed room erupted into yelling. Residents from the area placed at risk by the project and their supporters spoke unanimously against the project, and in one period of well over an hour beginning maybe an hour into the hearing not a single person spoke in favor of the compressor station. The Charles County Board of Appeals has already rejected Dominion's request for permission to build this project, on the grounds that the local Fire Dept cannot possibly deal with an explosion at the plant or put out the resulting fires. The only evacuation route would be MD 210, which in rush hour can become nearly impassable with traffic as it is. As of now, Dominion cannot proceed with the project but they could appeal, which would dump the project into the hands of the court system. FERC cannot pre-empt the MD MDE at all, and to pre-empt the rejection by the Charles County Board of Appeals would have to explicitly do so and has so far made no mention of pre-emption at all. Speaker after speaker laid into Dominion's claims concerning total air pollution from the compressor station. Almost every one of them took Dominion to the cleaners for failing to consider emissions from "blowdown" events clearing the turbines of gas at startup, shutdown, or in emergencies. These blowdowns would be nearly every day, and the emissions controls on the plant's turbine engines would be useless as the catalysts would be cold. The same is true of the catalytic converter on a car-but most cars do not have to purge an engine full of fuel vapor before every startup. One speaker who had lived near another compressor station reported routinely smelling propane from his house, presumably from blowdowns. In normal operation, a combination of oxidation catalysts(targetting unburned hydrocarbons and CO) and selective catalytic reduction (targetting NOx) are supposed to control pollution. This works rather like the catalytic converter on a car or to be more exact a "clean diesel" bus. Also like a car or truck, the catalyst is completely ineffective when it is cold, such as when the engine is being started. Unfortunaltely, this includes pre-startup blowdowns, and apparently shutdown and emergency blowdown events as well. Putting blowdowns aside, the sheer amount of fuel required to run 25,000 HP engines at full load hour after hour means great difficulty holding down pollution levels. An estimate has been published for 772,146 pounds of CO2 generated per day. About a third of this weight would be from the carbon in the gas, or roughly 250,000 points. If this were cars making the pollution, this would come from about 50,000 gallons of gasoline being burned every day. Thus, if the NOx, the SO2, and carbon monoxide were frozen solid and loaded into bags, they would be as heavy as sacks of concrete. An estimated 93 pounds of nitrogen dioxide, 30 pounds of sulfur dioxide, 75 pounds of volatile organic compounds (VOC) and a whopping 201 pounds of carbon monoxide. This probaqbly excludes blowdowns, which would add a lot more hydrocarbons (VOC) to the mix and against which the pollution controls do not work. On top of all else, Bryan Road is in a natural bowl or depression, rather like Los Angeles. Like in LA, this is a formula for trapped pollution under certain weather conditions, like putting the highway containing those 5,000 cars in a dome along with resident's homes. Still worse, the proposed exhaust stacks are to be only 4 feet above the roofs of the project rather than the EPA standard 2 1/2 times roof height. Thus, wind blowing over surrounding hills and descending into the low-lying Bryan Road area will blow the exhaust down to ground level, rather like an old diesel bus with exhaust pipes underneath rather than on top. 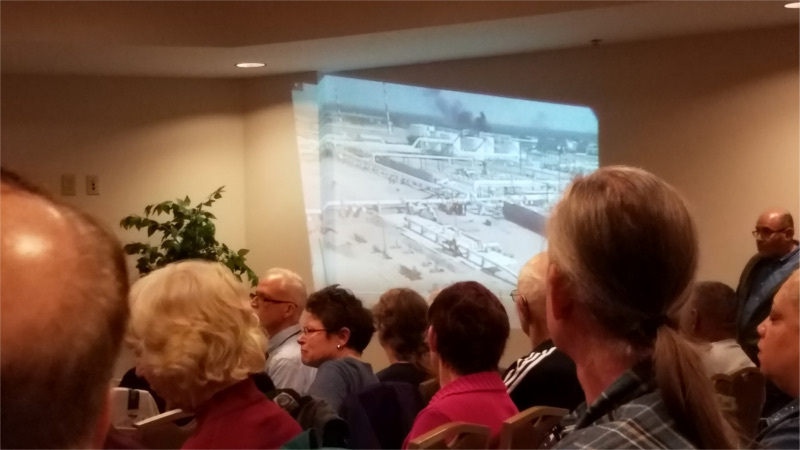 Some residents went so far as to compare Dominion's likes about gas being "good" and a "bridge fuel" that would not harm human health to similar claims once made by the cigarette industry that smoking was good for human health. The difference of course is that pollution passing over a company's property lines is better compared to compulsory smoking, something not even tobacco lobbyists ever had the nerve to advocate. The residents of the Bryan Road area would have to deal with all this pollution plus the fire and explosion risk but get no benefits and none of the gas. Dominion is building this compressor station to feed fracked gas to the export terminal at Cove Point in nearby Calvert County, MD. The only beneficiaries of the project will be Dominion stockholders and executives, everyone else gets only the price.